This couldn’t be easier and I use it about once a month during the spring and summer when I am being lazy what want something sweet in the house that will last a couple of days. 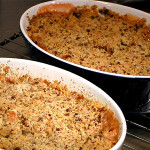 This is a good all purpose crumble topping for fruit crumbles! See my notes for some more suggestions. Makes enough crumble topping for a large apple or other fruit crumble. Chop the nuts by hand with a knife into small pieces, you can decide how fine you like it. In a bowl or on a clean work surface sift the flour with the sugar and baking powder and mix together well. Then add the cold cut up butter to the flour and working quickly press the butter into the flour and sugar using the tips of your fingers until you have a crumbly mass and all the flour in incorporated. This shouldn't take more than 5 minutes. You don't want anything that looks like pie dough, it should be light and crumbly. Add the chopped nuts and lightly mix them in. Sprinkle over the fruit filling and bake in a preheated oven 190° C or ( 375° F) for 25 - 35 minutes depending on the filling and how thick it is. Once the crumble is been sprinkled over your fruit take the 1-2 tablespoons of sugar and sprinkle over to give a bit of extra crunch. Chop the nuts by hand with a knife, chopping nuts in a food processor usually results in nut butter because the nuts contain so much oil. Place all the ingredients but the nuts in a food processor and pulse for a few seconds until mixture looks crumbly. Add the nuts and pulse for one or two seconds to just incorporate them. If you pulse it any more than that the blade of the processor will turn the chopped nuts into a paste and you don't want that. You can also keep this mixture in the fridge for a day or two in its mixing bowl if you need to covered with plastic wrap. Fruit crumbles are great and taste wonderful, there are 3 great advantages to fruit crumbles in the kitchen. They are cheap, usually very quick to put together and almost any fruit fresh or canned can be used. This is a very basic and good crumble topping recipe that works well with almost every fruit you might like to use, even very wet ones. 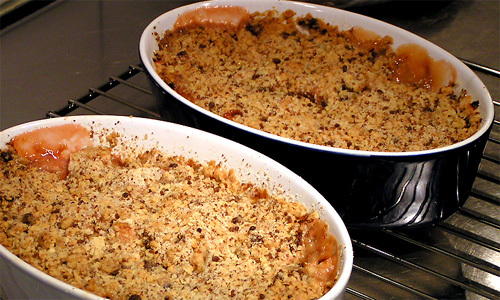 A great accompaniment to most fruit crumbles is Vanilla Sauce or Ice cream. You can vary this recipe depending on the fruit you have chosen by using mixed nuts, cinnamon, nutmeg, cardamom, powdered ginger and/or ground cloves. You can also add the grated rind of half a lemon, orange or lime. Add any of the above to the flour and mix in before you add the butter. Use all plain white sugar, home made vanilla sugar, or brown sugar it doesn't matter. The choice is yours.